Bromance is in the air while beer and football make the party: the 47th Super Bowl will take place on Sunday February 3rd, 2013 at the Mercedes-Benz Superdome in New Orleans. Kickoff time is scheduled for 6:30pm EST with simulcast on CTV. With most American ball parks and stadiums starting to stock craft beer, Toronto’s favourite independent brewery invites football fans to share a little brotherly love by calling the Steam Whistle Home Delivery hotline for delivery of fresh draught, bottles or cans of beer, loan of draught equipment or bottle troughs, and party planning tips. Steam Whistle’s Home Delivery, operating in the GTA since 2006, has taken the worry out of beverage service for everything from house parties to neighbourhood gatherings to Friday-afternoon-office socials. The home draught dispense cooler, pictured below, will be a great novelty for Super Bowl Parties. Additionally, gifts and party favours such as branded merchandise or souvenir bottle openers can be provided for an additional charge. 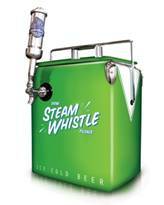 If thirsty patrons want to permanently install a Home Draught System into their bar or rec room, Steam Whistle’s Home Delivery service can assist in equipment purchase, installation, cleaning, maintenance and regular delivery of fresh beer kegs. 1. Guest List: Your guest list should include a strong group of old friends or acquaintances to ensure a successful party, but don’t be afraid to mix in a few new, compatible invitees to stir things up a little. 2. Theme: Pull out favourite team jerseys, pom poms and streamers to deck out your party rooms with all the fanfare of a Super Bowl game! Download football theme music to your iPod to help set the mood. Let your guests know the theme and you might be surprised at the face paint and costumes they show up in! Record everyone’s game predictions before kick-off and offer a door prize for the best guess. 3. Décor: Set up an arrangement of furniture to provide ample comfortable seating but also room for the party to flow into other parts of your house. You know how people like to congregate in a kitchen or even spill outside for a break! 4. Beverages: We can’t help but recommend you stock your bar with Steam Whistle Pilsner. Party guests love the fun of pouring a fresh draught. Alternatively stocking bottles in an ice-filled bin allows you to offer a variety of beverages such as beer, wine, coolers and non-alcoholic drinks all from a self-serve station. Generally assume 1 drink per person per hour in your planning. Remember to serve responsibly and offer to hold keys and call taxis if necessary.